Beautiful luxury 2 bed apartment with air conditioning. Within a 1 min walk to both the Vila Sol golf clubhouse and the new 5* hotel. This very large apartment is fully furnished to a high standard. Internet access in apartment and at pool and UK/Sky TV and Movies. Set in the Vilasol Resort it offers holiday makers many options. For the golf lover there is a 27-hole championship course that twice hosted the Portuguese open. A driving range, practice facilities, golf academy, large club house with bar, restaurant and pro shop. The apartment is set within beautifully landscaped gardens which is ideal for sunbathing by the pool. The 5* hotel has excellant facilities. 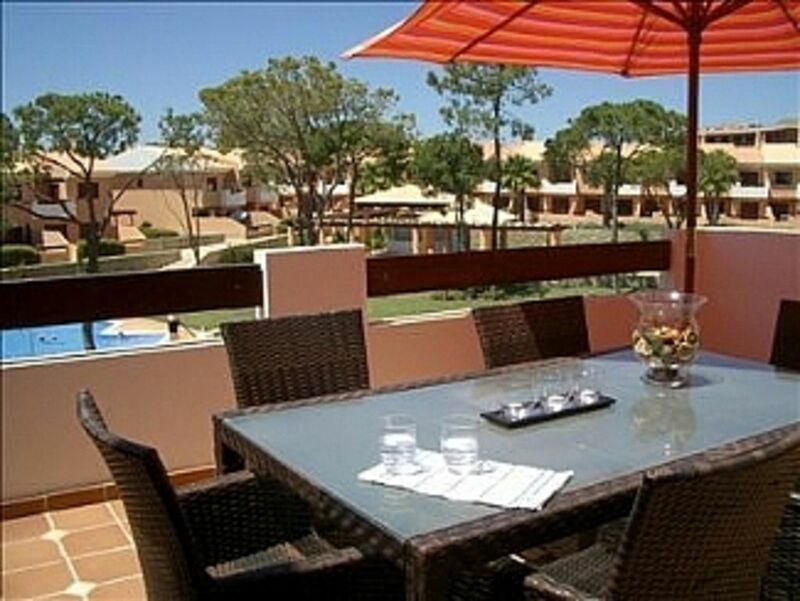 There are supermarkets, bars, restaurant, deli and shops close to the Vila Sol complex and also in Vilamoura’s bustling marina is a 5 mins drive and offers top class restaurants, shopping and nightlife. Hi my name is Fraser Boyd and I live in Ireland with my wife Orla and our 10 year old daughter. We live in Co Louth and both work in Dublin and enjoy visiting the Algarve for breaks and holidays. Olhao is a great place to relax and unwind. It is close to all facilities with great restaurants, shops, markets and marina. Easy travelling to Faro and the west Algarve and Spain. We bought the apartment as a long term investment and for somewhere to take our holidays. Having visited Spain on a couple of occasions the Algarve was a breath of fresh air with none of the commercialism and crowds. The people are friendly and the atmosphere is very relaxed, ideal for stress free holidaying. Plenty of activities for all ages and the weather is amazing and only 2.5 hours from the UK/Ireland. The property is set within the Vilasol Resort which has 5-6 condominiums similar to Sunsetvillas and set around a central swimming pool. Very family orientated, quiet and relaxed. Golf club and 5 star hotel are close with bars, shops and restaurant at the entrance to the resort. En suite to bedroom 2 with shower, toilet and sink. Main bathroom with Jacuzzi bath, shower, bidet toilet and sink. Fully fitted kitchen with marble tops. Fridge/freezer, washing machine, dishwasher, microwave, cooker & hob and area for drying clothes. Small table with chairs to relax. Kettle, toaster, coffee maker and other kitchen equipment. The apartment is 200m from Vilasol clubhouse with 27 holes of championship standard. Vilamoura has a further 5 top quality championship courses within 4 miles and within 10 miles there are another 10 to chose from including Quinta Da Lago and Vale Do Lobo. Further afield but within one hour's drive is many other courses and across the border into Spain. Notes on accommodation: The apartment is managed which ensures there is full support during your stay for any information and emergencies. Wifi is available next to the pool. The cabana has a wifi hot spot. Access can be gained on the apartment balcony but is not gauranteed. Outside: The apartment is part of a very well maintained complex finished in 2007. There is a shared pool with sunbeds and parasols and a communal BBQ area. The whole complex has been repainted in spring of 2014. Utility Room: This is a secure area off the kitchen which has area for drying and storing larger items. It houses the washing machine and is accessed through double sliding doors. Cleaning / Towels / Linen / Maid service: All linen and towels provided. Cleaned after every rent and on request for longer lets. Other: Large hall/entrance. Balcony with table and 6 chairs and parasol and stone Portuguese BBQ. Large roof terrace with recliners, firepit table, 4 chairs and parasol. Underground parking is available and on road parking is also available. Excellent value we will rent the property again. All good only one minor problem promptly fixed by the management company. We arrived on 11th of August until the 21st August and we were delighted with the location of the apartment. The view from the 2 patios overlook the pool with easy access to it. The apartment itself is spacious, clean and nicely decorated and the layout was perfect for my 3 teenage children and husband. The owner was extremely helpful with any questions we had before we travelled, along with detailed directions and this meant we had no need to contact him during our stay. We hired a car and there is parking just outside the apartment which was very handy, particularly if you have just stocked up with supplies from the nearby Pingo Doce supermarket. We thouroughly enjoyed our stay and will definitely stay again when we book our next holiday. We arrived late at night due to a delayed flight and were very upset to find no top sheets on the beds and unwashed bedspreads - without going into too much detail these were very unpleasant. It was too late to be remedied on the first night so we were forced to sleep with our towels as covers. The next day the management company came and took away the soiled bedding and we’re supposed to return it laundered after the weekend but this didn’t happen. We were instead left with some very worn (ripped and threadbare) comforters which were from the wardrobes - no idea if these were clean, they certainly weren’t freshly laundered. The problems with cleanliness extended to the sofa which is not the cream leather pictured but rather a nasty stained yellow. A (dirty) throw covered half of it but this was not nice to sit on either. The place also had an dirty floor (sticky) and an ant problem but the management just said to buy some insect killer - as if this is something you want to go out and go on arrival.... so we were definitely upset with some aspects of our stay. On the positive side the beds themselves are very comfortable, the air con and WiFi were excellent and the Sunset complex is lovely and great for families. I feel the lack of cleanliness of everything marred our stay and made the holiday off to a bad start and hope the owners will address this for future guests. Excellent stay. This was my second time staying here. Enjoyed thoroughly. Property is ideal for families. Everything is in the property that you would need. A home from home. Great communication with Frasier the owner of the property. Will definitely be back sooner rather than later. This apartment was great for my friends and I. The apartment was very clean and spacious. The Taxi company arranged from the airport were also very helpful. I recently returned to this Vila Sol Apartment, along with my partner and my two children (17 &13) after we first stayed here four years ago and once again we had a really nice, relaxing week. The apartment is very clean, well maintained and is located is very peaceful, pleasant surroundings, with a lovely swimming pool. It was well equiped for everything we needed during our stay and has a fantastic BBQ, which we used three of the six nights we stayed. I would say the location is slightly remote, so unless you are happy to use the local taxi's then I suggust you hire a car as we did, which is useful for visiting Vilamoura marina, Quarteria or the local supermarket. It's not often we return to the same place, but we are all glad we did and we are likely to return again!! The algarve has many top class beaches with the closest being Quateria and Vilamoura. These are 3 miles from the apartment. Faro airport is 15/20 minutes from the apartment. Vilamoura marina is 5 minutes drive. Booking Notes: Please phone Fraser Boyd on mobile 00353 (0)868511401 to enquire and make booking. Discounts are available phone to enquire. 30% deposit is required to book. remainder 4 weeks prior to stay. Changeover Day: Change over days is flexible and longer or shorter booking can be accommodated. With cheaper flights mid week it is often a preference for many holiday makers to do mid week change overs. Notes on prices: Prices are for the property per week in Sterling. If paying Euro the exchange rate will that which is on the date of transfer. Extra days are charged pro rata. Prices are negotiable - please call or email to enquire. Lets for longer terms Oct - March please contact to discuss.